There are many benefits to using native plants in your landscape! With the hot and dry South Carolina climate there are many native plants that do well in the Midlands. Not only do native plants produce beautiful flowers, they also produce fruits, seeds and nectar that are friendly to wildlife. Wild birds, native to the United States, evolved with a dependency on plants that are also native to the U.S. Some birds feed on insects, amphibians, fish, reptiles and small mammals. These food sources also depend on native plants for their sustenance. The plant life required to sustain our native wildlife is destroyed in the course of urbanization. Clear cutting trees for home building and office parks upsets the balance of nature and threatens some of our native species. For example, certain species of woodpeckers are endangered because homeowners are less inclined to plant oak trees, which make “messy” acorns for birds to eat. Monarch butterflies are endangered because the “host” plant on which they lay their eggs (milkweed) is seen less in nature. The Monarch’s eggs hatch into caterpillars, which eat the milkweed, before spinning a cocoon and later becoming a butterfly. 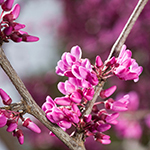 You can help to restore the availability of native plants, by adding a few to your landscape. In this way, we can all make a difference and help save endangered species one yard at a time. Most native plants require little care because the growing conditions here are perfect for them to thrive. Choosing the right plants for your yard will mean you may be able to use fewer pesticides and less water. There are varied definitions of “native plants,” however most people accept the idea that we are talking about plants that were here before the European colonization of North and South America. This brings into question, what about “cultivars” of native plants…. are they truly native? For example, Red Maple (Acer Rubrum) is native here. Its cultivars, Autumn Flame, Autumn Blaze, October Glory, Red Sunset, Summer Red, are also considered native. They were cultivated from red maple trees which were found in the wild and noted for their particular color or hardiness.